While there is showroom-in-a-showroom space within Hyundai’s new Global Dealership Space Identity dealer design project, the automaker is looking at all manner of options on how to best showcase and retail the upcoming Genesis luxury brand. “Luxury brands tend to do well in select, major cities across the country so, one day, it may make sense to focus the Genesis brand to regions with buyers,” explains Michael Ricciuto, director of product and corporate strategy with Hyundai Auto Canada Corp.
Euisun Chung, Hyundai Motor Company vice chairman, told the world about the plans in early November saying the company would spin off the Genesis name as an entirely new brand of luxury vehicles. The goal is street six models by 2020 aimed squarely at grabbing volume from the world’s top car brands. Two of those vehicles – Equus and Genesis – are current Hyundai nameplates. 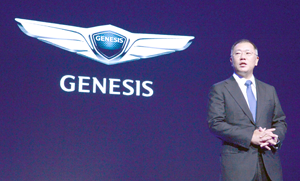 The automaker says its new Genesis brand will embody four key aspects: human-focused innovation; refined and balanced performance; athletic elegance in design and hassle-free customer experience. Marketing platitudes aside, Hyundai notes its newly created Prestige Design Division has been tasked with creating vehicles that offer distinctive design for the new marque. Luc Donckerwolke, who was previously responsible for the design of Audi, Bentley, Lamborghini, SEAT and Skoda models at the Volkswagen Group, will lead this new design division alongside his role as head of the Hyundai Motor Design Center. Peter Schreyer will oversee the division’s work as part of his group-wide design responsibilities as president and chief design officer of Hyundai Motor Group. How the retail operations will all shake out for Canadian Hyundai dealers remains to be seen. Ricciuto says the new corporate image program allows for space for feature vehicles so there is room for Genesis vehicles to be displayed in stores. 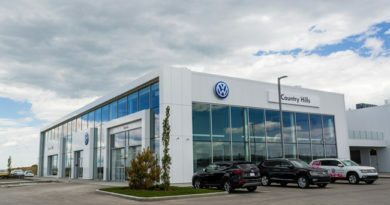 He tells Canadian AutoWorld it is far too early to know which dealerships will get to sell the models as the company still needs to decide how the brand will rollout in Canada. A distinct design identity, emblem, naming structure and customer service offering is currently being established. Genesis models will be badged with a new wing-type emblem, redesigned from the version used on the current Genesis model. The Genesis brand will also adopt a new alphanumeric naming structure. Future models will be named by combining the letter G for Genesis with a number, 90, 80 or 70, etc., representing the segment. Initial sales markets will include South Korea, China, America, Canada and the Middle East. The first Genesis model will be the G90 flagship luxury sedan – the Equus name will be discontinued at the end of the current 2016 model year. G90 is scheduled to hit Canadian streets in the first half of 2016. The second vehicle will be the current Genesis Sedan, set to be renamed G80 shortly after G90 arrives. Chung says the brand will have a focus on customers that want “smart ownership experiences” that save time, effort. Exactly what that “experience” is has not been nailed down. Ricciuto says while details are being worked out, Genesis will differentiate itself from the competition with a focus on the customer. “The manifestation of that for the shopping experience will be saving the customer's most valuable commodity: time. An example of that might be an expansion of the “Your Time, Your Place” valet program for sales and service with the Equus,” he says.